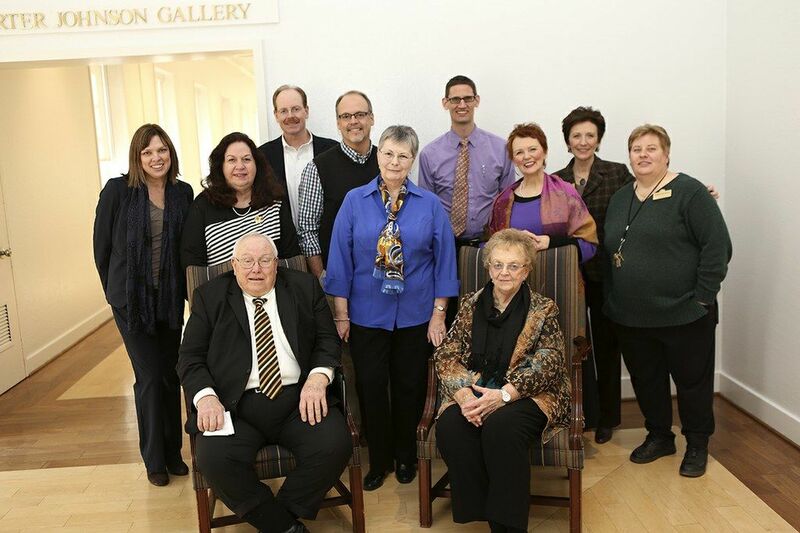 On Friday, January 31, 2014, the family of Dr. John Thomas Hammack visited Salem Academy and College to see the new home of an extensive music collection, generously donated to the School of Music. The collection, given by the family after Dr. Hammack’s death, is comprised of more than 13,000 recordings and 12 pieces of audio equipment and reflects Hammack’s lifelong love and appreciation of music of all kinds. Rose Simon, Director Emerita of Salem’s Gramley Library, said the gift quadruples the current number of recordings available in the Music Library. Visiting Salem were members of Dr. Hammack’s family – His cousin, Frances Hammack Ader Read and her husband, Henry, along with their sons, John and Hank. Hank Read is a resident of Walkertown, N.C., and his wife, Cammie Lowry Read, graduated from Salem in 2009 (MAT). John Read resides in Raleigh, N.C. Frances’ sister Nancy Ader Ragland, who participated in naming Salem as the recipient of this gift, was unable to visit campus. The family searched for an esteemed music program that would benefit from Dr. Hammack’s collection. Henry Read, the spokesperson for the family, shared that after careful thought, Salem was selected to receive this gift for: “Its proximity to Hammack’s birthplace, the School of Music’s distinguished reputation, and the eagerness of the School of Music staff to review the collection and ensure that its pieces are well-preserved, appreciated, and beneficial to the Salem community,” noted Read before adding that “Salem’s size and emphasis on the liberal arts ensures that professors are helping students achieve their maximum potential.” Hammack’s collection undoubtedly will benefit Salem Academy and College instructors and students alike. Dr. Hammack was born in Walkertown, N.C., and attended Oak Ridge Military Academy (N.C.) and Hargrave Military Academy (Va.). He earned degrees at Wake Forest and Miami (Fla.) University, and his a doctorate in psychology from UNC Chapel Hill. He lived most of his life in Bethesda, Md., where he was a research scientist in psychology at Walter Reed Hospital and the National Institute of Health for over 35 years. Through his love of music, Hammack was affiliated with the Association for Recorded Sound Collections and was a universal music collector. His library, now part of Salem’s music library, includes selections from all genres – classical (amassing 80% of his collection), jazz, folk, pop, Broadway, musical theatre, among others. According to Raleigh-based appraiser John Lambert, Hammack’s collection is “astonishingly rich and diverse… clearly purchased with an eye to repertoire plus performing artists.” Hammack often purchased three copies of each recording, and only after significant research. “The recordings from Hammack’s collection give Salem much needed resources to develop entire new courses and programs centered around music,” said Susan Calovini, Dean of Salem College, who spoke at a reception held for the family. “What a generous spirit Dr. Hammack must have had to amass such a collection and then plan to share it in the future,” she added.